A place to grow crops from any season, year round! The Greenhouse is a building present on the farm from the outset. However, it is initially in a state of disrepair, making it unusable. You can repair it by completing the Pantry bundles for the Community Center, or by a purchase from the Joja Community Development Projects for 35,000g. The interior of the building features a 10-row-by-12-column plot of land. There, you can plant, grow, and harvest Crops at any time of year without reference to normal season restrictions. Scarecrows are not required in the greenhouse to prevent crows from eating crops. Crops do need to be watered, even on rainy days. There is a water trough along the north wall. Standing on its east side, you can refill your Watering Can. Fertilizer in the greenhouse lasts for one season only. 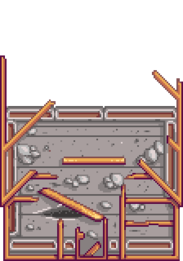 There is a wood border one tile thick surrounding the crop rectangle. It is possible to place sprinklers on this border to water any of the tiles of the crop land within its reach. 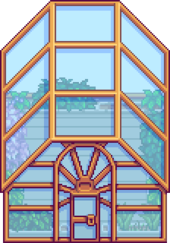 Between the wood border and the greenhouse walls is a region two tiles thick that is unsuitable for crops, and populated along the walls with decorative items (plants, tools, barrels, water trough). 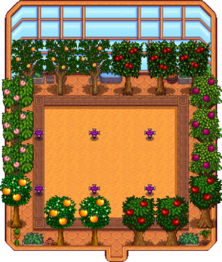 It is possible to plant fruit trees at any spot in this region not occupied by decorations, so long as there are two tiles between fruit trees. Fruit trees cannot be planted in the corners of the Greenhouse. Neither the greenhouse wall nor the wood border itself will impede the growth of the fruit trees, although a one-space separation must be maintained between the tree and any items (like sprinklers) that are placed on the wood border or exterior region during the time the tree is growing. Crops and fruit trees in the greenhouse will never be hit by lightning. Bee houses placed inside of the greenhouse produce no honey. Given that the greenhouse permits the production of most crops, regardless of season, its limited growing space is valuable. Crops that yield multiple harvests can be allowed to continue producing indefinitely without need for replanting, although fertilizer will usually expire at change of season. If you intend to use automated sprinklers to water crops, some soil tiles must be sacrificed to place the sprinklers. The growing area is too large for any sprinkler to water the center from any edge. 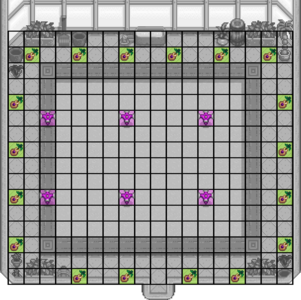 In addition, the 12-by-10 shape of the farmable area cannot be covered only with the square shapes of sprinkler watering. The many possibilities yield various optimal sprinkler placements that cover the soil tiles while using the fewest possible sprinklers in plantable locations. Some sprinklers are inevitably placed on the wooden border. With iridium sprinklers, only 4 crop spaces (3.3%) must be taken, while with quality sprinklers, 12 crop spaces (10%) are occupied. 16 Quality Sprinklers. 12 crop spaces are occupied by sprinklers (-10%), leaving room for 108 plants. 6 Iridium Sprinklers. Only 4 crop spaces are taken by sprinklers (-3.3%), leaving room for 116 plants. 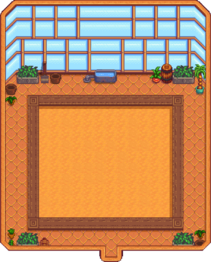 Fruit trees can be grown on any tile in the exterior region of the greenhouse that is unoccupied by decorations, so long as other tiles adjacent to each tree are empty of items the player has placed there. Neither the greenhouse walls nor the wood border around the crop rectangle alone impede fruit tree growth. Fruit Trees cannot be planted in the corners of the Greenhouse. It is possible to grow as many as 18 fruit trees inside the greenhouse. One possible optimal placement is shown below. 6 Iridium Sprinklers and 18 Fruit Trees placed to maximize planting space and trees. 1.07: Trees can no longer be planted on perimeter tiles around the soil area. 1.1: Trees can once again be planted on outside perimeter tiles. 1.3: Trees can no longer be planted on top of decorations in the greenhouse border, or in the corners of the greenhouse. This page was last modified on 22 April 2019, at 01:19.